Item description: Letter, 15 March 1862, from Jeremy Francis Gilmer to his wife Louisa Fredericka Alexander Gilmer. 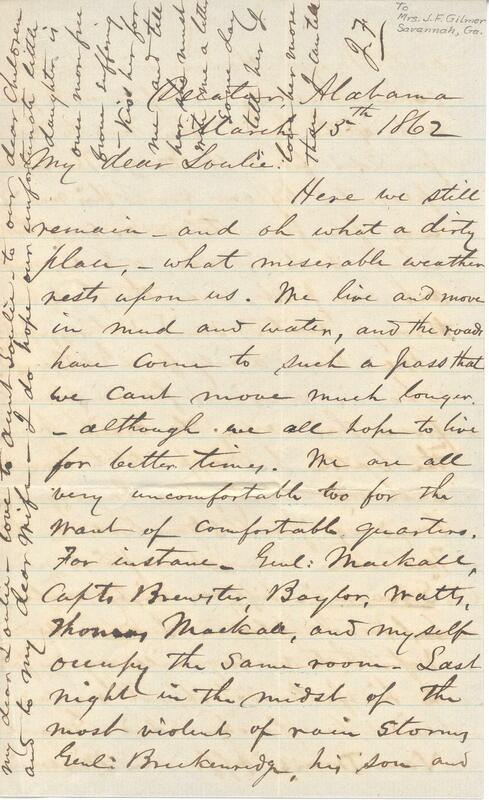 In this letter, Jeremy Gilmer writes to his wife about the difficulties with the weather and his living quarters in Alabama, as well as news about the progression of the war, news of the wounded, and his potential promotion. Here we still remain – and oh what a dirty plan – what miserable weather rests upon us. We live and move in mud and water, and the roads have come to such a pass that we can’t move much longer – although we all hope to live for better times. We are all very uncomfortable too for the want of comfortable quarters. For instance, Genl. Mackall, Capts. Brewster, Baylor, Watts, Thomas Mackall, and myself occupy the same room. Last night in the midst of the most violent of rain storms, Genl Bruckenridge, his son, and Major Hodge, his adjutant, came rushing in upon us to get out of the rain. They had to be provided for & sheltered. The sight presented by our room this morning was far from the tidy or comfortable – but such is man, and we must act our part – even though it be through water, mud, & discomfort. We hear daily from Genl Beauregard who is anxious for reinforcements from this army to assist him in the battle he expects to have with the enemy, now landed and landing from steam boats on the Tennessee river, at a point near “Savanna” – fifty or sixty miles below this place. I have some hope that victory will again fall to his fortune: if not, our cause will be dark indeed – General Van Dorn’s affair in Missouri I am sorry to say, turns out to be no victory: at best, only a drawn battle. He is now back in Arkansas, having retreated the next day. All reports confirm the death of McCullock, McIntosh, Hebert, & others high officers – Genl Price was wounded in the arm, but not seriously. 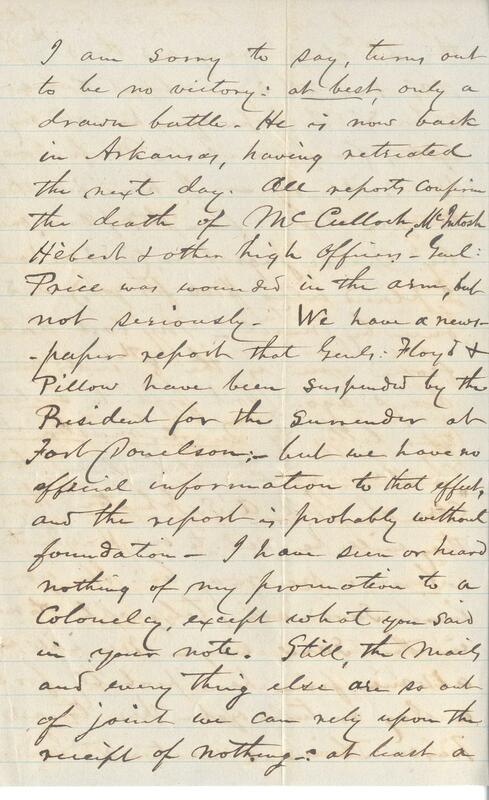 We have a newspaper report that Genls Floyd & Pillow have been suspended by the President for the surrender of Fort Donelson – but we have no official information to that effect, as the report is probably without foundation – I have seen or heard nothing of my promotion to a Colonel, except what you said in your note. Still, the mail and every thing else are so out of joint we can rely upon the receipt of nothing – at least a dozen of your letters to me, written between the 25th of January and the 8th of this month have not yet come to hand. 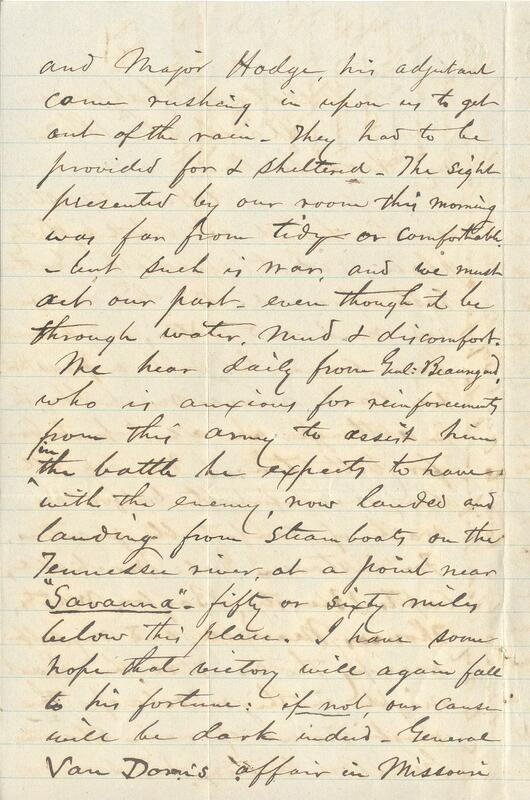 I hope you have recd my letter from Donelson, Murfreesboro, Huntsville, etc – I have written to you twice from this place, one by Lieut Ingraham (in whose hands I placed also $100 for you) and one by mail. My last date from you is the 8th inst, seven days ago. 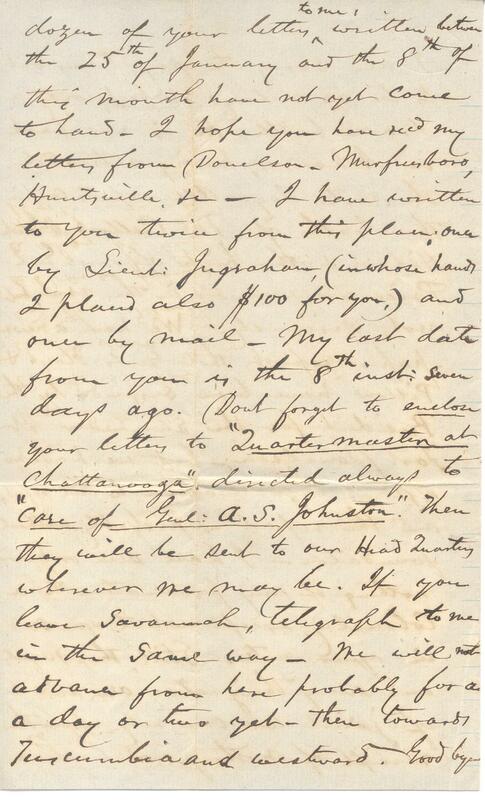 Don’t forget to enclose your letters to “Quartermaster at Chattanooga” directed always to “Care of Genl A.S. Johnston“. Then they will be sent to our Head Quarters wherever we may be. If you leave Savannah, telegraph to me in the same way – we will not advance from here probably for a day or two yet – then towards Turcumbia and westward. Goodbye my dear Loulie – love to Aunt Loulie, to our dear children and to my dear wife – I do hope our unfortunate little daughter is once more free from suffering – Visit her for me and tell her she must write me a letter some day tell her I love her more than I can tell. This entry was posted in Southern Historical Collection and tagged Jeremy Francis Gilmer, Louisa Fredericka Alexander Gilmer, weather. Bookmark the permalink.